As is clear from its name, Find Ultra Premium Merchants is a program that will bring you the best deals, coupons, and exclusive discounts while you surf the web. It might seem that it will help you save money and time; however, this is not true at all. According to our security experts, Find Ultra Premium Merchants is a typical advertising-supported application, which means that it just seeks to drive traffic to particular websites, and there is no doubt that you will see various commercial advertisements on your screen as well. Actually, it does not matter which browser you use because the program is compatible with all of them. This means that the only effective way to stop ads from appearing is to delete Find Ultra Premium Merchants from your system. Scroll down and find the instructions below that will help you remove this adware. 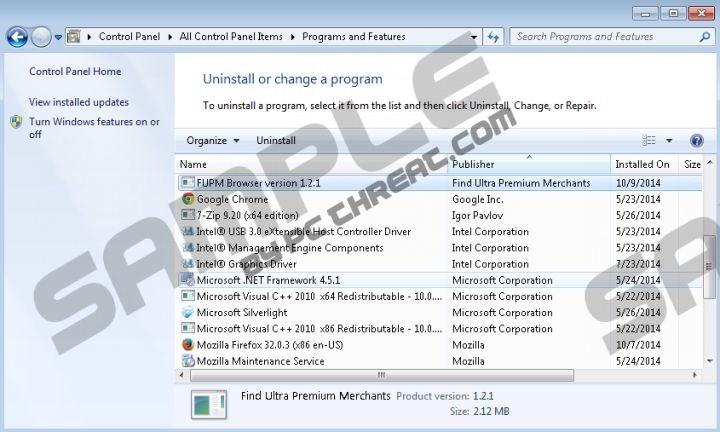 The specialists at pcthreat.com have tested Find Ultra Premium Merchants and found out that this program will not only show advertisements that might redirect you to corrupted websites, but that it will also collect information about your activities on the web. On top of that, it adds the process BrowserManager.exe which searches for available browsers and then tries to open the website www_getwindowinfo. This might happen very frequently, which will annoy you very much. Therefore, you should carefully think about whether you really want to keep Find Ultra Premium Merchants on your system. We do not think that you will miss this application, because it is basically useless. Find Ultra Premium Merchants has an official website (fupm.net) where you can find more information about it. Actually, it seems that it is impossible to download Find Ultra Premium Merchants from there; thus, it can be inferred that this application usually travels bundled with other unreliable programs. If you have already detected Find Ultra Premium Merchants on your system, there is a possibility that your PC contains more unreliable software, which is why it is worth checking its condition. As this program is not a very harmful one, it can be easily deleted via Control Panel. If you do not like the manual removal method for any reason, or if you do not have experience in malware removal, you definitely should invest in an automatic malware remover and then perform a full system scan. All the existing infections will be deleted, and your security tool will protect your system from future infections. Select the suspicious application. Click Remove. Locate and open Control Panel. Right-click on Find Ultra Premium Merchants. Quick & tested solution for Find Ultra Premium Merchants removal.